Also, where I am from, more and more people are waking up. 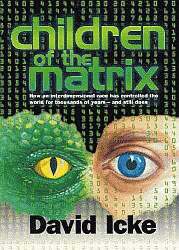 And currently, I am reading Children of the Matrix. I was watching a movie today about the revolution and there were a LOT of rep.[tilian] symbols, like the symbol for the french revolution. I think that it is sad today that people do not look at the "big picture" with the world. There are many things if people look at closely that really does not make sense that the world government says is true. They want people to believe in what they say.. however, there are people such as me and many others who learn to open their eyes. I was in Europe during the Sept. 11th "attacks", when I saw it on the television, I thought it was a movie. But then they showed the Pentagon and I realised that was real life and not a movie. I could not believe my eyes. But here is the picture. You see, for the past two years I was uneasy about flying. And the American Airlines as well. I had a dream two years ago about being in a plane, an American Airlines or United ( do not remember which one) and this man was trapped in the bathroom on the plane talking on the cell phone. I saw the pilots who did not seem as real pilots who looked and felt evil. In my dream, the plane went down and crashed. But I do remember the man was screaming about the plane being taken over. The sad and scary part is that it actually happened. That same day, I did a little remote viewing and wanted to see who or what caused this. I did see a dark skinned man with a white hat. He was at some sort of camp and the place he was at was very hot. I saw him on the phone talking to someone and it was in English. He had a thick accent. I keep track of all of my dreams and write them down. I have told my friends about them and sometimes they get scared and want me to tell nothing more because it is reality. I have decided to make a website about events that have happened or will happen. These are not predictions.